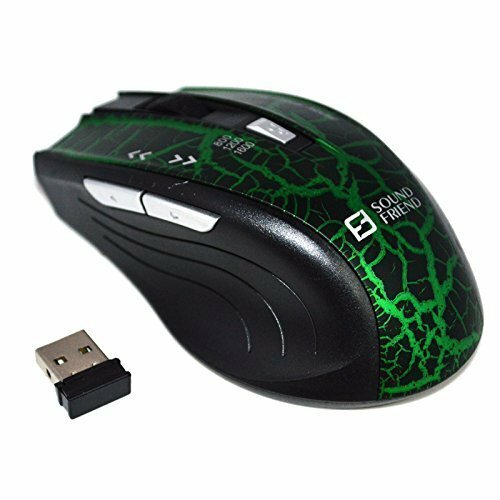 This wireless usb port mouse was good partner for your PC, laptop, not only for gaming , but also for home use and office. you need it! If mouse is not used for over 5 minutes, the light will turn off, it will turn to power saving mode to save energy. Game level of 2.4GHz wireless muse. Ergonomic Design: comfortable hand feeling, reduce fatigue. 1.The side buttons are not available for Mac OS because the system itself is a closed one, not open to the public, but the other function can be used normally. 2.Please kindly note if you do not use the mouse for 5-8 minutes, the item will go to Energy-saving mode. After the item go back to sleep, you can press the any button to weak it up. 3. Long time not using the wireless mouse, please power off the ouse (backside) to save energy. ☞ Reliable Connection with the Advanced 2.4ghz Wireless Technology Adopted: this wireless gaming Mouse can be operated at a working distance up to 10m (free space) 3 adjustable DPI level ( 800, 1200, 1600) to change the speed of mouse freely. ☞ PLUG-and-PLAY WIRELESS: with high speed USB 2.0 receiver. just plug the wireless receiver into your computer's USB port, and you're ready to go with No Extra Driver Required. Compatible with Windows98, Win2000, Win XP, Win7, Win10，Vista, MAC OS ect PC , laptop, note book, macbook. ☞ Ergonomic Comfort: This cordless gaming mouse Is ergonomically designed to fit snugly under your palm, providing you an Incredibly comfortable gaming experience In-hand. expecially for entry level or midel casual gamers.